What is a "U" turn? 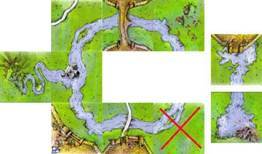 Are you using any extra rules to ensure that the river can be completed? Are the farms on either side of the Spring joined? Which river tiles are used when you combine the two river sets? The complications regarding "U" turns are fully explained in the section below, together with an optional rule you can use if you want to ensure a tidy, complete river (the official rules do not require the river to be completed). The other two points are simpler. The statement from Hans im Glück is "Officially, the farm goes around the spring. So it is a connected farm. I personally prefer to use it as a division, since otherwise, despite the river, there is still only one large farm." So you just need to make a decision as you start the game as to whether there is one farm on that tile or two. Which tiles should you use if you want to combine both sets of river tiles? You now have too many springs and lakes. The official ruling is very simple – just discard one spring and one lake, so that you make one complete river with two branches. I would recommend discarding the volcano/lake if you are not using The Princess & The Dragon, and keeping it in if you are. Personally I find 22 tiles is too long a river, so sometimes we just use a selection of interesting tiles to make a river-length of our own choosing, making sure that the number of river-end-tiles is the same as the number of branches. 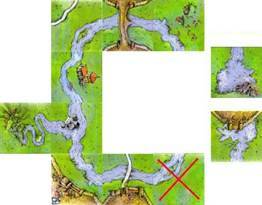 The original rules state "a river tile may not be placed so that the river makes a "U" turn". This has generated many queries. The official response from Hans im Glück is that only immediate "U" turns are prohibited. This can still lead to some confusion, especially when you add the branch from "The River II". In the rare circumstance where a drawn tile has no legal placement (and all players agree), the player discards the tile from the game (into the box) and draws another tile to play. Features such as roads and cities can be left incomplete. It is permitted to play a tile when you know that by doing so you are creating a space which can never be filled, either because the required tile doesn't exist or because all the possible tiles have already been played. and unscrupulous players may legally decide to play in such a way that the river does indeed become unfinishable. The complications start to arise when multiple wide "U" turns are used as in this example. 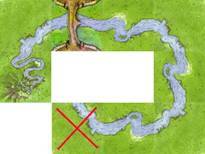 Although the last tile placed was a legal play, it has left the river unfinishable. Following the basic principles stated above, this is not a problem. The next player just picks up each of the remaining river tiles and the lake and discards them, then continues with the normal tiles. The river remains unfinished. The official ruling from Hans im Glück is "Try to think while playing. Players may have an unfinished River...but it‘s their own fault." 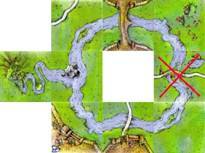 Of course, if the tiles are played to this position, the river is again, unfinishable. If you were using "The River" and "The River II" combined, then yes, the next two tiles might be curves which could be played legally to allow the river to be finished, but that would require someone to look at the next two tiles to make sure that it would work. It is much simpler just to make such plays illegal, then you know that you can finish the river without worrying about what is left in the pile.